Wooden Wardrobes are an important part of our Homes. Wooden Almirah comes in a variety of designs. But traditional designs are the most sought after. 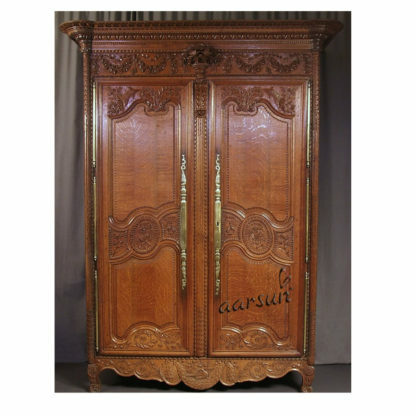 Aarsun Handcrafted Wooden Almirah reflects the rich traditional heritage. This handcrafted unit is made by skilled craftsmen from premium quality Teak Wood that has many advantages, one being termite resistant which makes it long lasting. Traditional Furniture made in Saharanpur, India is famous for its Mughal designs and patterns. This Almirah / Wooden Wardrobe comprises of 2 Framed Door Panels with striking engravings at each panel. each frame in the panel depicts a unique design with traditional Vintage finish. The unit can be made as per your need. The shelves, the carving and the size of the entire wardrobe can be changed as per your home interiors. This enticing wardrobe can enhance the entire look of your place. Moreover, you can have the shades altered in case the current shade is different from your home interiors. We at Aarsun Woods believe in delivering products as per buyers’ needs. We excel in customization and provide home delivery (Contact us for confirming your pin-code). Contact us at +91-8192999135 / 8266888634 in order to place customization requests. Have doubts? Chat with us now or mail us at aarsunwoods@gmail.com to get details before buying it for your home.